on rooftop overlooking the Vatican/St. Peter's Basilica. During this week in Rome, Maryknoll Fr. Roy Bourgeois had meetings with high-level Vatican officials. Fr. Roy shared with me today that these conversations were open and positive. Stay tuned for the next chapter in this powerful story of a prophetic, priest of the people, who speaks truth to power in a loving non-threatening way. Thanks to Women's Ordination Conference and Call to Action for all they have done to promote justice for women in the church. (Special thanks to Erin Hanna, Kate Conmy of WOC, and to Nicole Sotelo and Bob Heineman of CTA, and to Miriam Duigan of Womenpriests.org) The smug mug photos provided by WOC are great! Thanks for sharing this piece of history with us. 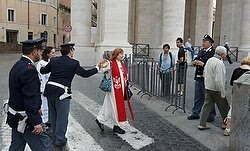 Roman Catholic Women Priests, while not allowed in St. Peter's Square, by Police, were not arrested or detained by police. Perhaps, the Vatican did not want the negative publicity as a number of people have said. It is my hope that we have begun a healing process of centuries old misogyny in which spiritual power was invested exclusively in men. Fr. Roy Bourgeois's prophetic witness is a challenge to the deeply ingrained sexism in our church. I believe that women in vestments are visible reminders that women are equal images of God, therefore are worthy to preside at the altar. We are offering the church a new pathway forward to a more open, people-empowered, Christ-centered,inclusive church in our grassroots communities now. The good news is that 200 U.S. priests have signed a petition supporting Fr. Roy's right to speak his conscience. Primacy of conscience is a major teaching of the church. In July the Austrian -based Initiative of 300 Parish Priests announced a campaign of resistance that supports women and married men in the priesthood. Over 250 German theologians as well as the Irish Priests Association have followed suit. This week the Vatican got a glimpse of representatives of the women priest movement up close on its own doorstep. We have heard stories of support and openess even from officials in the Vatican! Let us hope that we are on our way to critical mass. There are over 148 media stories including programs airing on Italian and BBC television. The story of Fr. Roy Bourgeois and the Roman Catholic Women Priests Movement has been broadcast all over the world this week. The "Fr. Roy goes to Rome Story" is now available 24-7 on google and social media! Check out great pictures on smug mug. (link on WOC site) Let us pray for open hearts and open minds. Let us stay open to the Spirit moving in our midst. "A Colombian First Woman Priest in Latin America" Media Interview with Olga Lucia Alvarez in Spanish With Photos. Olga Lucia Alvarez, ARCWP, first woman priest in Latin America. "W Radio", belongs to Prisa in Spain, and It has a daily 12 am to 18:30 pm, radio talk show which is called "W" and It’s broadcasted to New York, New Jersey, Southern Florida, Orlando, and Panama, Ecuador, Colombia and Spain.We are considered the most important Spanish speaking radio speaking with an average audience of 2 million listeners and also recently "W Radio" has entered the ranking of the 10 most listened to station in the world via the Internet. 1) There's a great amount of archeological evidence available about the lead roles that women held in the early Church. As evidenced at the Church of St Aurea in Ostia and in the Catacombs of St Priscilla in Rome. (well worth seeing for yourself).Our thanks to Dr Dorothy Irwin, who participated in this week. 2) Many religious congregations which have their houses in Romeare quite knowledgeable and sympathetic to the causes we hold dear -- re-examination of the nature of priesthood; opening up service in the priesthood to all believers; re-balancing the relationship of the sexes within the Church. These are some powerful potential allies. 3) Fr Roy Bourgeois, MM is as genuine, gentle and clear-sighted aswe've believed he is. He has been articulate, creative, humorous andcompassionate to all in the delegation. The international delegation of16 which has accompanied him is no less thoughtful and engaged. We definitely felt change in the air on the issue of women's ordination. There is a groundswell of support, reflected in the 148 news outlets that determinedto cover our modest march. 4) "Pink Smoke Over the Vatican" is a terrific vehicle for showing what ordinationmeans for bright, articulate and thoroughly delightful cast of our friends featuredin the film. It will soon be available for wide distribution. "Freedom of the Press" -- "You have no right to film me without my permission. You have no right to quote me without my permission," Msgr who came thru while the press was there. 6) Pat McSweeney of Taunton Massachusetts and Mike Toner of Buffalo arethe best of traveling companions. We've had a great time. Thanks Bob for sharing your insights from this historic moment in our church's history. We in the international Roman Catholic Women Priests Movement owe a debt of thanks to Nicole Sotelo and you and thousands of Call to Action members and to Erin Hanna, Kate Conmy of Women's Ordination Conference as well as so many organizations and individuals, like Maryknoll priest Fr. Roy Bourgeois, and millions of Catholics worldwide who support Roman Catholic Women Priests with their prayers and hopes for a more open, just and inclusive church. We are grateful to Miriam Duigan from womenpriests.org for being a wonderful translator, whose witness got her detained by police along with Erin Hanna and Roy. A special thank you to the gang of eighteen who have come to Rome to witness our support of Fr. Roy and our gratitude to this priest of the people and prophet for justice. With Mary, mother of Jesus, Mary of Magdala, Junia, Phoebe, Priscilla and the holy women and men of the Gospel who were faithful disciples of Jesus we rejoice in our God for this holy shakeup that is bringing a new dawn of justice and equality to our church! 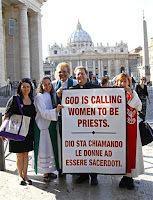 Great News from International Supporters of Women Priests in Rome! The petition signed by 15,000 reporters has been delivered. Fr. Roy Bourgeois, prophet for justice and priest of the people, met with high-level Vatican officials. Way to go Fr. Roy and delegation of women priests supporters. You are moving the issue light years ahead! World media is on board too! Don't worry about the banners that Roman Police confiscated! One day, the may wind up in the Vatican Museum! Meantime, a supporter here in the U.S. has already said he will purchase next one! The issues of women priests is causing a spiritual revolution that is being felt by the Vatican. ..."In little more than a decade, New Life Covenant Church in Chicago has grown from 68 people to more than 4,000 members; it had to abandon its old building and meet in Clemente High School. When you include the other churches New Life has started, its membership comes to some 12,000 people. The Rev. Wilfredo de Jesus is leading the movement to give a little color to the mostly white Pentecostal faith. He says — and statistics bear him out — that Latinos are saving American Christianity. "No doubt, every denomination would have decreased in membership," he says, "if it had not been for Hispanic growth, including our fellowship, the Assemblies of God." It's a truism that 11 o'clock on Sunday morning is the most segregated hour of the week. But the people streaming into New Life's sanctuary are black, white and Asian, as well as Hispanic. Most, like de Jesus, are second-generation Latinos. And three of four services are in English. Indeed, much of the church's growth is fueled by Hispanic-Americans shedding the faith of their parents. De Jesus says he can spot them every time. "People come to the church, and I'm in the lobby area, greeting visitors — and they say, 'Hey Father, thank you for the Mass today.' I know where they're coming from." They're coming from Catholicism. Polls by Pew Research Center show that fewer than 60 percent of second-generation Latinos are Catholic — and the ones who leave Catholicism head for the more boisterous evangelical churches, like New Life..."
Italian television featured an interview with Fr. Roy Bourgeois and Janice Sevre-Duszynska. Imagine what a hit this program was with the Vatican prelates after the debacle with the Roman police yesterday. One of the important critiques I offer is that they mentioned the police detained Fr. Roy and two women supporters. How come the media did not mention the names of the two courageous women? 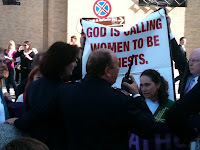 I had to make a call to Rome to find out that these two women were: Erin Hanna, executive director of Women's Ordination Conference USA and Miriam Duigan, (translator) from Womenpriests.org in England. This video reflection shows the ministries of Roman Catholic Women Priests in the Western Region of the United States. Oct 17, 2011 "From Where I Stand"
"The story is an old one and I've told it before, but never has it felt so ominous as it does right now.It happened this way: About 15 or 20 years ago, I gave a series of conferences in a parish in Canada.So I was surprised when the topic came up at lunch from the couple hosting my visit. More than that, I was surprised at what triggered it..."
"It wasn't the dearth of theology around the question of the ordination of women that piqued them. It wasn't the growing statistic on the coming decline in the priesthood that worried them. It wasn't the fear of merging parishes that troubled them.On the contrary. They had a good parish, they said, a fine and loving parish priest, the kind of congregation that was family to them and the kind of faith to trust the ongoing work of the Holy Spirit among them.What bothered them was their 4-year-old daughter. She was a quick-minded child. Precocious. Persistent. Confident. They knew, they told me, that some day, she would question the difference between what her brother could do in the church and what she could do. That would be years away, of course, but still — maybe more for themselves than for her — they were struggling, to no avail, to find a reason good enough to appease her, they said. Then, suddenly, one Sunday morning after Mass as they sat at the family breakfast table, it happened. "Mama," she said suddenly, "why don't we have any girl priests at our church?" They looked at one another, dumbstruck, unprepared. Too late. There was nothing left to do now but be honest. "Because, darling," the mother said, "our church doesn't allow girl priests." The little girl pursed her lips and frowned. "Then why do we go there?" she demanded. With the retreat to Vatican I in full force, this question and its answer get closer and closer. Bridget Mary's Reflection: Out of the mouths of babes, the Spirit speaks a question for all in our church to hear. Maryknoll priest, Fr. Roy Bourgeois, women priests Janice Sevre-Duszynska, Ree Hudson, deacon Donna Rougeux, Erin Hanna, executive director of Women's Ordination Conference, Miriam Duigian, from womenpriests.org, Bob Heineman, Nicole Sotelo and other supporters of women's ordination are raising the question of God's call to women to embrace a renewed priestly ministry in Rome this week. Let us pray that this prophetic message of justice and equality for women in our church is heard by all including the Vatican. "The fact that the Italian police had such trouble with the Occupy Rome group that turned violent meant that the police were "on edge". On Monday morning, Oct 17, the press joined us for a showing of Pink Smoke Over the Vatcan. Followed by a press conference including our own Nicole Sotelo. We then walked up the center of the wide boulevard, Via della Concilllazione to a security fence in front of the Vatican. Mike got some great shots. There we were not permitted onto St Peter’s Square 1) because of our signs, 2) because of the women priests being dressed in alb and stole or 3) because we were a group (take your pick). Long negotiations ensued. Ultimately, what happened was that the police conceded that Roy could go into the plaza to deliver the petition. But they would NOT give permission for the women, especially the women priests. And Roy would not go without them. At that point the three women and Roy decided to have their picture taken, with a sign that Roy had purchased. That sent the police over the edge. An undercover officer grabbed Roy's sign to show it to one of his captains. Because Roy had the sign made in English and Italian, the police. could read it easily (none of them spoke English). The plain clothesman grabbed Roy's sign and threw it in a waiting police car. I had been standing aside with the WOC banner and CTA sign folded up for some time. (at least 15 minutes) I had no intention of unfurling it again. But after Roy's sign, they came after me and I ditched the sign just before they got to me. Unfortunately I had no good place to ditch it and theypicked it up rather easily. They took the signs and again threw them into a police car. I believe that was just before the put Erin (the WOC director) and the woman who had been acting as interpreter (Miriam) intoa squad car. They were driven off with siren blaring. Soon Roy was told a car was ready for him. Roy ,on the other hand, was driven to the station with no fanfare. The detainees were released about two hours later. Bridget Mary's Reflection: "Women Priests Rock Church"
Thanks to Call to Action's Bob Heineman for this colorful account of the fracas in the Vatican yesterday. The Vatican refused to allow Maryknoll priest Roy Bourgeois to deliver a petition with 15.000 signatures supporting his stance for women priests because he was accompanied by women priests dressed in alb and stole! 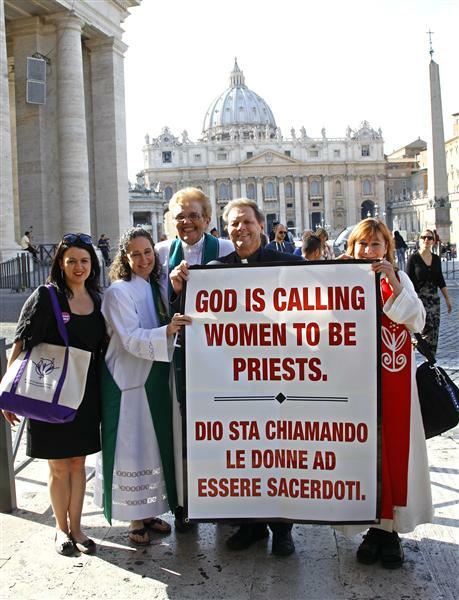 Yes, indeed,women priests are rocking the church and shaking up the Vatican hierarchy as we share women's experiences and claim women's power as spiritual equals. I wonder if any cardinals or bishops (maybe even the pope) caught a glimpse of the dustup in St. Peter's Square. I believe that on a deep spiritual, mystical level women priests are beginning a healing process of centuries old deep misogyny in which spiritual power was invested exclusively in men. 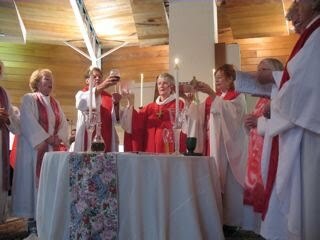 We are visible reminders that women are equal images of God, and therefore worthy to preside at the altar. In inclusive grassroots communities Roman Catholic Women Priests are moving the church toward partnership in a Christ-centered Spirit -empowered community of equals. For some, like the Vatican , women priests are a revolution. For millions of people, the time has come for a holy shakeup that will bring new life, creativity and justice to the church and beyond. NCR "The demonstrators, including two women who claimed to be priests and one a deacon, walked from Castel Sant'Angelo to St. Peter's Square carrying banners that said "God is calling women to be priests" and "Ordain Catholic women" while singing and beating a small tambourine." BMM:The two women are priests: Janice Sevre-Duszynska, Ree Hudson, and Donna Rougeux, a deacon. Interesting that neither the women priests, nor deacon were arrested or detained by police, while Erin Hanna of the Women's Ordination Conference and Miriam Duigian of Womenpriests.org,(neither woman is ordained) were detained as was Fr. Roy. What message is the Vatican sending here? NCR "Police explained to the group that it was illegal to hold a demonstration without a permit and that it would have been more appropriate to have called Vatican officials ahead of time in order to deliver the petition. "It's not like delivering a pizza, you can't just show up" unannounced and without authorization, the undercover police officer said. "It's a very important pizza," one of the demonstrators shouted." BMM: Truly, the Vatican is the gift that keeps on giving! Now that explanation really takes the cake, the piazza or whatever!!! This sounds like the dialogue in a comedy late night show like Saturday Night Live. You really could not make this stuff up! NCR: "Father Bourgeois was told several times by the Italian police that they could not prevent him from entering St. Peter's Square by himself to try to deliver the petition to someone in the Vatican, but the group as a whole and specifically the women dressed as priests could not enter the square because "their form of dress is a form of protest." NCR "However, the situation grew tense when police tried to confiscate the group's banners and fliers. Members of the group refused because the vinyl banners cost a lot to produce, one demonstrator explained." "Because of their refusal to hand over the banners peacefully, Father Bourgeois and two members of the group, Erin Saiz Hanna, executive director of the Women's Ordination Conference, and Miriam Duignan of WomenPriests.org, were brought to a nearby Italian police station. They were not arrested and no charges were made against them." BMM: Come on, can anyone believe, this whole dustup with the police was about vinyl banners? Why would the Roman police want banners advertising women priests now? Evidence, you say, really of what? Obviously, the women's presence said it all! What is this about -- gathering souvenirs for pilgrims? Or hey, wait a minute. could there be something a bit sinister going on here? Is there someone in the Vatican, thinking ahead a hundred years or so, of a banner display in the Vatican museum. Or perhaps, they could be photo copied for holy cards or perhaps, even become relics! Don't laugh! stranger things have happened in the Catholic Church. Just read the history! Speaking of history or in this case we should say "herstory", Roman Catholic Women Priests may be a revolution to the Vatican but we are a holy shakeup welcomed by millions of Catholics in the church and beyond! Rome, Italy – This afternoon, an international delegation of women’s ordination leaders including Roman Catholic priest, Fr. Roy Bourgeois, marched to the Vatican with a petition signed by 15,000 supporters. Fr. Bourgeois has been threatened by church officials for his public support of women’s ordination. Members of the delegation including Fr. Bourgeois, Erin Saiz Hanna, Executive Director of Women’s Ordination Conference, and Miriam Duignan of Womenpriest.org were detained and then released by local police authorities. 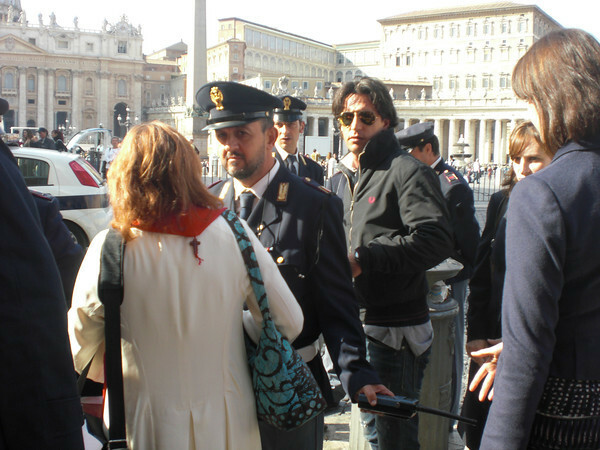 The delegation of fifteen leaders was met by local police at the gate of St. Peter’s and was denied entry. Plain-clothes policemen apprehended the delegation’s banners stating “Ordain Catholic Women,” “God is calling women to be priests” and “Call To Action.” The banners have been withheld as evidence for a pending hearing. Those who were detained were not officially arrested but their case will be heard by a judiciary court. Our prayers and thoughts are with these courageous witnesses for justice and equality. 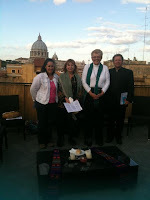 Erin Hanna, Executive director of Women's Ordination, Miriam Duignan of Womenpriest.org , and Maryknoll priest Fr. Roy Bourgeois were detained by Roman police. They were part of an international delegation who came to Vatican with 15,000 signatures of support for Fr. Roy who faces dismissal from the Maryknoll Order for his support of women priests. The interesting twist to this story is that the police did not detain Roman Catholic Women Priests Janice Sevre-Duszynska, Ree Hudson or Deacon Donna Rougeux, who were part of the international delegation who accompanied Fr. Roy to the Vatican. The reason seems to be that they were vested in liturgical attire! If this is so, then this is one for the history books! See Associated Press Photo below of Women Priests Janice and Ree dressed in alb and stoles. "Catholics campaigning for women priests detained at Vatican"
"The Rev. Roy Bourgeois and about a dozen supporters had marched down the main boulevard leading to the Vatican holding a banner "Ordain Catholic Women" and chanting outside St. Peter's Square "What do we want? Women priests! When do we want them? Now!" Police prevented the group from entering the piazza and told them to take down their banners since they didn't have a protest permit. When police then tried to confiscate the banners, members of the group resisted, resulting in Bourgeois and two supporters being taken away in police cars, witnesses said. The three were detained for about two hours at a Rome police station and released without being arrested or charged, though prosecutors were still investigating, said Bourgeois' attorney, Bill Quigley. 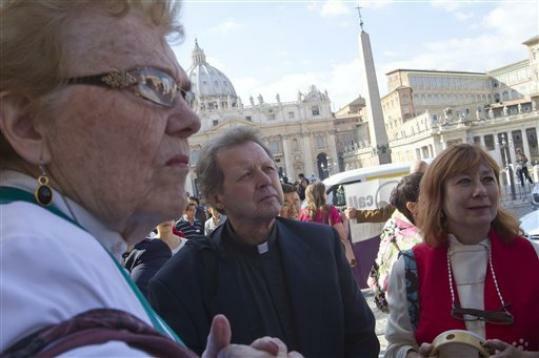 Bourgeois and members of the Women's Ordination Conference and other groups that support women priests had come to Rome to deliver a petition signed by some 15,000 people backing Bourgeois, who is facing dismissal from his Maryknoll order for his support of women's ordination. The Vatican's Congregation for the Doctrine of the Faith in 2008 ordered Bourgeois to recant his support for women priests or risk excommunication after he delivered the homily at the ordination of Janice Sevre-Duszynska, one of several women who have defied the Vatican and begun passing themselves off as Roman Catholic priests." VATICAN CITY (AP) — "A U.S. Catholic priest who supports ordination for women has been detained by police after marching to the Vatican to press the Holy See to lift its ban on women priests. The Rev. Roy Bourgeois and two supporters were taken away Monday in a police car after their group marched down the main boulevard leading to the Vatican and chanted outside St. Peter's Square "What do we want? Women priests!" One of Bourgeois' lawyers, Bill Quigley, says police had tried to take the group's banners and members resisted. 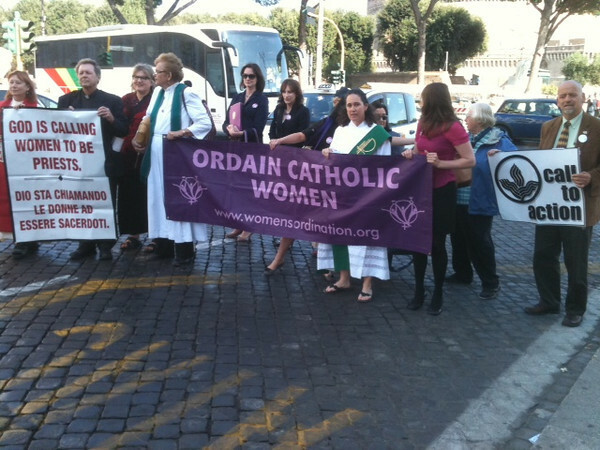 Bourgeois and members of the Women's Ordination Conference and other groups that support women priests had come to Rome to deliver a petition backing Bourgeois, who is facing dismissal from his Maryknoll order for his support of women's ordination. Follow @nytimesworld for international breaking news and headlines. " I wonder who the two courageous supporters are!? ROME, ITALY - Today, at 12:00 noon at Casa Del Cinema (Sala Kodak), Largo Marcello Mastroianni, representatives of Catholic organizations from around the world challenged the “grave scandal” of women’s ordination in the Roman Catholic Church, calling for the full and equal participation of women as deacons, priests, and bishops in a renewed church. The remarks came following the Italian premiere of the award-winning documentary film, “Pink Smoke Over the Vatican,” during a press conference held by Women’s Ordination Worldwide and other pro-ordination organizations. The activists traveled to Rome with Fr. Roy Bourgeois—an outspoken priest on the issue of women’s ordination—to hand-deliver a petition signed by 15,000 supporters on the issue. After the press conference, the groups staged a vigil in St. Peter's Square. Firm in his conscience, Fr. Roy Bourgeois has broken through the Vatican’s culture of fear to stand with the 63% of Catholics who support women’s ordination in the United States. “Increasingly priests around the world are rising up for women’s equality and ordination in the Catholic Church,” stated Nicole Sotelo, from Call To Action (USA). “Just this summer in the United States alone, 200 priests signed the Clergy for Conscience letter supporting Fr. Roy and his right to speak his conscience. Together, we are creating a stronger, unified movement that carries high the scriptural mandate to preach the good news, without censure, but rather, firmly rooted in one’s conscience: ‘there is neither male nor female; for you are all one in Christ Jesus’” (Galatians 3:28). “A holy shake-up is taking place here," said woman priest Janice Sevre-Duszynska, "that is challenging the institutional church's sexism which treats women as second class members of their own church and contributes to violence toward women in society. Women priests remind us that women are equal images of God and therefore worthy to preside at liturgy and the sacred rituals of our church." In 1976, the Biblical Commission of Pope Paul VI determined there was no scriptural reason to prohibit women's ordination. Despite the Commission's finding, the Pope issued a statement later that year declaring the Vatican is not authorized to ordain women. “Christian history documents that women were deacons, priests and bishops in the early church. As a result, we know that Canon 1024, which states that only men can validly receive the sacrament of ordination, is blatantly sexist,” concluded Hanna. "German Theologian Ursula King, Keynote Speaker Gives Overview of ,' A Spiritual Revolution...for Equality and Peace' "
"German theologian, Ursula King, was the guest speaker on Saturday, Oct. 9, 2011 for the 100th anniversary celebration of the founding of St. Joan's International Alliance in London, England. She began by introducing us to her latest book, Rediscovering the Fire. As a young woman Ursula studied for two years with Joseph Ratzinger who got his first chair at the University of Bonn at the age of 33. She was 19. When Ratzinger got to the Vatican, he became more reactionary she said. Ursula recalled an incident that never left her. When she was a young theologian, a very old woman came up to her at a conference and said: "You young women have it so easy. You didn't have to go to prison for the vote." Another memory surfaced. While living in Bombay years ago she read an article in "The Examiner" addressing the Nuncio about his comment blaming the pharmaceuticals for birth control. The writer then told the Nuncio, "It's the laity that wants birth control. "Since the 1960s there has been a great unprecedented leap forward for women's rights.Before that time women died giving birth or spent much of their lives raising children. Only nuns and rich women had time to devote to work for social transformation." Our Herstory needs to be sought out and then illuminated," Ursula said. "Our Herstory bees to be used as the leaven to pull us forward for the further evolution of women and men. "What is happening now, she said, is the transformation of all faiths. She recommended we read "Scripture as a Source of Empowerment," written by a woman from India. Also, "Gendering the Spirit: The Last Frontier," which is a collection of essays by women from Southeast Asia." A silent revolution of fundamental social transformations, a change of consciousness from the ground up is taking place," Said Ursula. "It is a spiritual revolution in secular movements for equality and peace, values which come from spirituality. "From the Christian and Quaker movement came the Parliament of World Religions in Chicago in 1893. There the first ordained Unitarian woman minister (Blackwell1853) gave a speech on women in the pulpit and the importance of women preaching and being ordained. Ursula challenged our idea of Florence Nightingale which she said is really male stuff we've picked up, not women's. In "Florence Nightingale:The making of a radical theologian by an Aussie writer we learn that Nightingale found the family too narrow a space and longed for a woman Savior, a female Christ. In the 1987 international book,"Daughters of the Buddha," we learn that in Avata Buddhism the nuns want the spiritual equivalent of males. Yet, major monks were against it. The last full ordination of women monks happened in the 11th century.Hindi women since 1971 have been denied reading Sanscript scripture. Now more Hindu women are engaged in the spiritual movement.We learned that the largest Muslim population in the world is found in Indonesia. And, in "Women Shaping Islam," that Muslim women function as judges and teachers of Islam. "There is a search for liberation and justice in the grassroots who are making a statement for justice for Muslim women," Ursula said. Today there are 18 million Chinese Muslims. For 400 years, since 1600, there have been female imams. Suggested reading: "The History of Chinese Mosques. "Within global transformation, there is the process of educational literacy, of being able to read the classical languages, such as Greek, and of reading sacred literature in light of contemporary issues. Women are becoming more fully human says Katarin Hulkas in "Awakening the Energies of Love. "Meanwhile, "the church is slowly moving itself into a corner of irrelevance," Ursula said. "You really have to fight for your goal. "Her final recommendation was "From Reason to Wonder," a book about science and faith. After Ursula King's talk on the worldwide movement toward liberation, justice and equality, we were permitted to ask questions or make comments. Folks learned that I was an ordained RCWP during our prayer service when I prayed for the continued growth of Roman Catholic Women Priests and those who support us as well as blessings on our work for justice for women at the United Nations. Now I wanted to make sure that people understood that our Ordinations and our movement for women priests just wasn't adding women and stir. Rather, it was about what we in the Women's Ordination Conference reiterated for 35 years: A renewed priesthood in a reformed church. I spoke about our non-hierarchal structure and circular governance; that we are a community of equals; that our bishops function to ordain women; that our liturgies are inclusive and all are welcome including the divorced, GLBTs and non-Catholics; that we are worker priests; that all say the words of consecration. Later as we were leaving the building, I said good-bye to Ursula King and she thanked me for making saying what I said. In addition to speakers Ursula King and Myra Poole were longtime members Ianthe Pratt and Mary Dietrich from London and our own Dorothy Irvin who spoke about the Alliance and our work at the United Nations as well as the need for better communication among members in the different countries."